From your little one graduating from preschool to your not so little one graduating from college, you want to announce it to the world. Your kids will love these unique looking graduation announcements. These can even be personalized to include a photo that is the ultimate announcement that your guests will truly love. That's not all, at Polka Dot Design, you will find something for your older graduate as well. For those graduating from a college or high school, they will want something extra special. First, make their announcements exciting by choosing from our selection of brightly colored announcements. They will also appreciate the fun looking and personalized photo announcements that are available. Not only that, but you can shop through our large selection of graduation party invitations. When your child graduates from high school it is truly is bittersweet, you are filled with such pride over their accomplishment, yet your heart tugs as you imagine them officially leaving the nest. A child's graduation is a time of reflection, snapshots of the past and dreams of the future, so it really deserves a celebration. You may be asking around about how to make college graduation announcements really count? Our recommendation is to make it personal, start your high school grad announcement hunt with what will reflect your offspring's personality the most. Maybe you consider monogram graduation announcements, this is a timeless and polished option, and you can get the matching monogram thank you notes to really set the tone for a lifetime of gratitude and acknowledgment. After all is said and done, we really just want our kids to be ready to take on the world. What are graduation announcements? You might ask, well, they are simply the perfect way to brag on your kid and really show them off. You can let the world know that your kiddo has made his or her mark and why not throw a party into the mix? Whether it is from College, High School or the in between, using the graduation invitation is your way of creating a setting for your child to feel all the support they deserve. 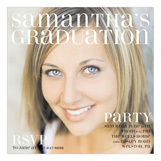 College graduation invitations or graduation party invitations are great for not only a party, but also an invitation to the graduation ceremony. Show your graduate the love with all the right stationery to match the invitations and announcements. Announcement cards are no longer stuffy, they are personal. We don't ever want to be the parent that forgets the little things, and usually, it is the little things that turn into the big things for our children. Graduation parties and announcements are one of those little things that can really let your child know that they are the light of your life. Maybe you throw a "build your future" party or a "keys to success" party. Imagine "build your..." food stations, build your own slider, build your own brownie bar, build your own sloppy fries bar. You get the picture. Then invite your guests to pen words of advice, keys to success to show your kiddo that they have more support than they ever imagined. It's the best time to let them know, they got this thing called life. Whenever you consider a graduation announcement our best advice is to make it personal after all, your graduate deserves the very best, the very most in thoughtfulness, and to have something that truly is a reflection of who they are. One of our favorite graduation announcements is the photo graduation announcements. The graduation announcement ideas on Polka Dot Design website and blog truly is limitless. We have announcements for girls that are preppy, classic or romantic. We have BoHo style's or modern and simple. For the guys, we have every card for every high school vibes, maybe you want to do an announcement in the school colors, or something around their sport or school activity, just let us know what's on your wish list, we have our in-house designers that will help you create the perfect photo high school graduate announcement or college graduate announcement. Maybe you're just getting started and it's time for your little one to graduate from kindergarten and you want to send out a kindergarten graduation announcement. Whatever your heart desires we are here to assist you every step of the way. When your little ones come into our world we truly can't help but celebrate every chance we get. It just seems that our kids make us proud with just about whatever they do. Children are such a gift, and at Polka Dot Design we really do celebrate every event with that personalization and care that you can only get from a small, family run business like ours. We get it. Once you determine what you want to do for your event give us a call or check out our website for just the right announcement there are limitless ideas on our Polka Dot Blog, we have recipes, and all kind of party ideas and you can always call or Customer Care to bounce ideas off of. But don't let it stop there, think about even ordering some personalized stationery take can help your graduate step out in style maybe you can do a classic personalized monogram or something with their first middle and last name in a script to make it more formal or keep it simple and just let it have "a note from" with your child's name inserted, it's a thoughtful and fun way to help them stay engaged with all the people in their lives, especially if they are going off to college. Cute stationery is just a really fun little gift that also gives back. So don't let any more time slip by, and most certainly, don't let it overwhelm you, we got this! All you have to decide is how many people you want to brag to about your child's accomplishments! After all, is said and done, there really are only a few handful of moments that you really get to celebrate such big accomplishments, don't let this one slip by. Order your graduation announcements right now, and then move on to planning the party! Save up to 20% or free shipping on custom graduation announcements or invitations online. For more information, contact us via email or call the Polka Dot hotline. This is where out customer service team can help you with questions like what are graduation announcements for and how to make graduation announcements online at Polka Dot Design. Call today!